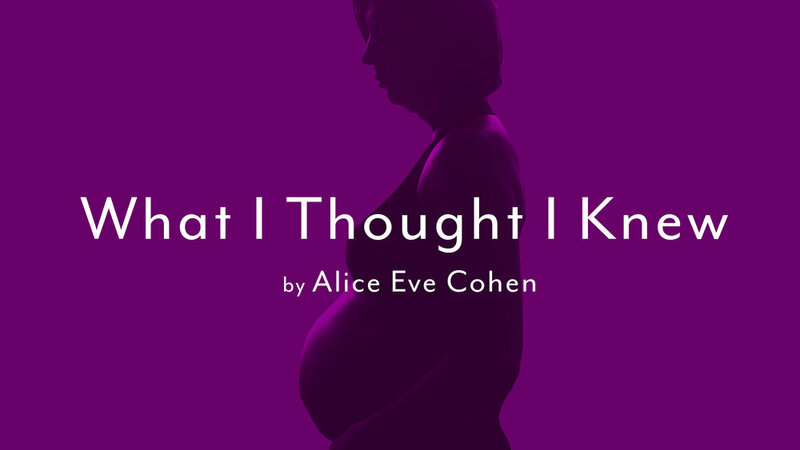 Alice, an infertile Jewish woman in her 40s, discovers a hard lump in her abdomen. After months of tests, a doctor determines that she is pregnant. Through endless health and wellness appointments during her unplanned high-risk pregnancy, Alice shares her most intimate thoughts and fears as depression sinks in. Told with honesty and humor, this powerful, one-woman-show based on a true story poignantly reveals one woman’s journey through the American health care system. Experience this heartfelt play anchored in motherhood, marriage, and the cycle of life. Based on the book by Alice Eve Cohen that Oprah hailed as "Darkly hilarious... an unexpected bundle of joy." What I Thought I Knew features Kim Kivens playing nearly 40 different characters in the course of 90 minutes. Kim was previously seen at MJTC in Church & State, Hershel and the Hanukkah Goblins, Natasha and the Coat, and was recognized by Lavender Magazine as a Best Supporting Actress for her role as Muriel in Dirty Rotten Scoundrels (Minneapolis Musical Theatre). Read more about the production and the artists here. Kim, what is it like to play nearly 40 characters in the course of 90 minutes? This is what drew me to this piece…It is a challenge, for sure, but so much fun. I love a good back story and to give these characters in the play that only show up once or have one line or two the same attention to those who are showing up throughout, is so important. It helps me to marry their physicality and voice. This one-woman performance is based on a true events and the book of the same name. Due to these facts, how have you approached this play differently? Knowing that you are putting up something on stage that actually happened can be daunting especially when it’s a story such as this. When I first read the play, I had a lot of jaw dropping moments. This story is, in so many ways, unbelievable. Which can create challenges to convey to the audience the reality of it. It’s raw and our main character, Alice, makes herself so very vulnerable and open. She invites the audience into her journey. Breaking that wall with the audience is difficult sometimes for an actor but for this play, the way we want to tell this story, it’s important. As a mother yourself, what aspects of Alice’s journey do you find relatable? Foreign? Well, we adopted our amazing daughter, Lily, from Russia in 1999, which is right around the time this story starts to take place. I could relate to Alice, heavily, being an adoptive parent and having my own past personal struggles with infertility. The foreign aspects for me, I have experienced being pregnant and the loss of pregnancy but I have never been in labor. Then there are some of the agonizing thoughts that go through her head throughout. I go back and forth on what I would do exactly if I were in her shoes. That’s something, after working on this piece, I can honestly say I am not sure I could ever have an answer for. and having my own past personal struggles with infertility." Jennie, as director, how do you make sense of all the changes in time, space, and character within this complex single narrative? First, you just accept that we are operating outside of linear time and space. This play does not replicate reality. Then you define where we are: in this case, we are in the auditorium at Highland Recreation Center, with Kim Kivens and the particular and specific group of people who have come to hear this story. That may sound obvious, but it’s actually quite specific and defining. We will not sit in the dark and lose track of where we are, lose ourselves in the story. Instead, we remain aware that Kim is using her tools, skills, and immense spirit to bring to life another woman’s story. It could feel disorienting to be without the visual cues that a set and lights and props and costumes can give us – instead, we entrust ourselves to this human, to Kim, and agree to witness her journey through this story. As an audience, we have the opportunity to bring our whole selves, our experiences and memories and points of view, more actively to the story. We sit with our friends and family, we see their faces and they see ours. Next, Kim and I are working intimately together to build a vocabulary of gesture, voice, and small objects that ground each moment of the story in a context. This play is about sitting in a room and listening to a story. It’s not ABOUT the many different characters and places visited in the story. It’s not ABOUT documenting and repeating characters and stories. It’s about conjuring a point of view, and witnessing this woman retelling her story. She has a need to tell this story – what is that need about? She has a goal, something she needs from the audience -what is it? Will I feel like I want to give it to her? Will it be something I am even able to give? Why is she using these particular objects to tell her story – what is specific and important about each of these objects, how do they help her tell the story? This kind of storytelling is not about finding out what happens next – we all know what HAPPENS – we’re here to understand Alice’s experience of what happened, how she makes sense (or doesn’t) of what happened, how “what happened” has shaped her and her understanding of the world. She’s not always a “reliable narrator” in the sense of objectively describing situations and characters – instead, she exposes her experience of situations and characters, she gives us the gift of seeing her story through her own lens. "How do we make sense of the things that happen to us?" Does Alice’s story transcend her very specific medical situation? What do you hope the audience will take away? Absolutely. It’s a story about how she carves agency out of situations that are out of her control. How do we claim choice in the face of overwhelming outside forces? How do we make sense of the things that happen to us? How do we build our life and self out of the things that happen to us? Alice is faced with an impossible situation, and she finds a way to choose her way forward, to actively decide her path. She fights fiercely to retain her ability, her right, to choose her path forward. She finds ways, through humor and imagination, to avoid falling victim to circumstance, to wrest agency from her impossible situation. I was talking to my sister in law, who is a nurse, and about how the interesting thing about this story, for healthcare professionals, is not about the structural mess of our health care system – which we all battle every time we interact with the system, from inside or out – but about how providers and care coordinators can build a culture where all patients are encouraged to find their own sense of agency, regardless of circumstance or outcome. What are the health benefits of that agency? What are the negative impacts when choice is taken away, when others start to make choices for a patient? How can we build a heath care culture where the patient’s goals are our guide? "this one is going to be special." The real, living, changing, vibrant relationship that Kim will build with each and every audience. While live theater is never an exact replica of itself from performance to performance, this one is going to be special. Kim’s relationship with an audience is going to be so responsive (I promise, she’s not going to touch anybody, or make anyone else perform) that the experience of the story is going to depend as much on the specific humans in the audience as it does on the script. The audience is Kim’s scene partner. To purchase tickets, click HERE or call (651) 647-4315. For more information on ticket pricing and special rates, click HERE. For more details about the production, click HERE.